Secret Golf's Steve Elkington talks golf with his mentor, the legendary Jackie Burke. NARRATOR: On this episode of The Rural Golfer. -Lots of people have problem putting. 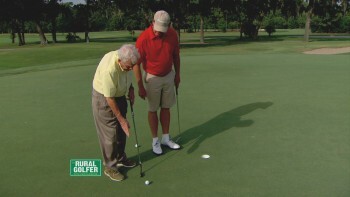 NARRATOR: Hall of Famer Jackie Burke Jr. Shares his philosophy on putting. -You cannot energize a golf swing or a putt. You let the weight of the putter do that. NARRATOR: And reminds Elk that golf is-- and always has been-- a simple game. -You can't say, I hope my putting's good today. You have to know how to putt. -You haven't hi- you haven't missed one today. -I see I-I'm sorry. I f-forgot that bit. NARRATOR: The Rural Golfer rolls your way next. We got the big show ribbon that rides around the map. Where we're going next, we just can't say. Quick, grab your clubs. Let's hit some balls. We'll be makin' friends and playing golf. The Rural Golfer's coming your way. NARRATOR: With a break from the tours, Steve Elkington enjoyed a little R&R at home. But while in Houston, he never misses an opportunity to do some work on his game. -So I've been off a week. Got to spend some time with Jackie Burke who totally fixed my party. And I thought to myself, why don't we go over and get him to fix everybody's putting today. So if you're going to watch a show-- a Rural Golfer show, this will be the one to watch. Come with me. NARRATOR: When it comes to putting, there's only one road to take as far as Elk is concerned. And it leads straight to Jackie Burke, Jr.
-Mornin'. How are y'all today? GOLFER: Good, how are you doin'? STEVE ELKINGTON: I don't know how many times you've fixed my putting. How many times do you think you've fixed my putting? JACKIE BURKE, JR.: Well, it's not hard to fix when you were with the University of Houston. It wasn't too hard it's getting harder now that you out here playing for this money. JACKIE BURKE, JR.: Well, I just gotta make sure that it goes through that Australian head. STEVE ELKINGTON: I know. Well today, we're going to talk a little bit about putting, course. And lots of people have problem putting. You know. Beginners have problem putting. And even Tiger Woods and Phil Mickelson have problem putting. So you're going to help us start you--today we're going to try to, you gonna give give us the basics, huh? -I am. I'm gonna show you. I'm gonna to show you. It-it's-- you can't say, I hope my putting's good today. 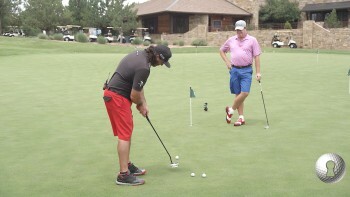 You have to know how to putt. And there, it's a simple thing to know how to putt. STEVE ELKINGTON: Aww, come on. Where's that been on the tour. -We should start teaching golf from the green back to the tee, instead of teaching people to hit balls on the driving ranges. They need to learn to putt and chip first. -And you know what? I-I'm buying this putter as soon as I get back in the shop. Look at, look at that. STEVE ELKINGTON: So someone that was watching this this lesson, like me, how would you, how would you tell 'em to, how would you tell 'em to start out? -Well I tell 'em to first put the putter in his hand up here. STEVE ELKINGTON: Not up there. STEVE ELKINGTON: And not down there. Just sort of in the middle? JACKIE BURKE, JR.: Right. It's just is in the bottom of, of that part of your hand right there. STEVE ELKINGTON: Yeah. And then where's the right go? JACKIE BURKE, JR.: Right just fits right on it. STEVE ELKINGTON: No, no, no big-- open that up. STEVE ELKINGTON: Why do you-- that's well, that's kind of old school move. JACKIE BURKE, JR.: I-I put it in front because it's good to start motion. STEVE ELKINGTON: Oh I see. So you say you put it in front. It does two things, right? It gets the hands up. JACKIE BURKE, JR.: Gets my hands in forward and then it starts the motion. STEVE ELKINGTON: I mean a lot of guys back in, back in the day put the club in front didn't they? JACKIE BURKE, JR.: They did. Because that assures you that your hands are up here. If you were gonna throw this club, you certainly wouldn't have your hands back here. STEVE ELKINGTON: Back there, no. JACKIE BURKE, JR.: Your hands would be up there and you'd throw it like that. My dad teaching golf used to make me throw club. -He'd make you throw clubs. STEVE ELKINGTON: Give him another one, Mike. What was the le-- show me the-- give me the lesson on that. -Put your hands on the club up here. Don't ever put your hands on the club with the club on the ground. STEVE ELKINGTON: Always up in front. -Always up here. And that hooks your arms up. And then you can if you go back you get-- this shoe right here should, You should go back and land on that shoe. And that's what you get. From there you can throw. Swings uh, need hips. The first uh, instructor-- for the first guy was a guy with a spear that threw a spear. He had to throw it with his hips. -One second you, we're going back to tribal. Yeah. -To kill the pig to go eat. He can't stand here dead-footed and throw it. You gotta move your hips to throw something. -You, you've always said that the first athlete was always, you know. It was a guy that was a hunter. -The chieftain sent him down for so the tribe could eat tonight. -The chief didn't send a guy that went out there like this, right? -He picked an athletic guy, someone that was quiet. -He didn't he didn't crush the limbs and run the pig off. He would sneak up on the pig and then throw the spear and he'd get dinner. -Well then the tribe's not gonna eat tonight. STEVE ELKINGTON: Where do we start? -I start right here. Well I'm gonna show you the size cup that I put up at on long putts. Now if you complete this circle with balls, that's the cup that I'm putting at a cup is wide as this putter. -If I'm good at this circle, then I can chip in at this circle. And I can play with bumper shots in this circle. And I can flag putts at this circle. I don't even think of this, I don't even think of this cup. I mean how can you think of a four and a half inch circle over there from 40 feet. You've got to be losing your mind. -Well and also um, uh. -You'd make it every time. STEVE ELKINGTON: The amateur guy doesn't realize that he's not a bad putter. He just has no idea how to read it. JACKIE BURKE, JR.: Well, he just putts at the cup. STEVE ELKINGTON: Is that, is that what the problem is? JACKIE BURKE, JR.: The problem is he's the cup is his object. Instead of the breakline. You see Steve, every green has a spine. You go to the back of the green and you come all the way down there. And it's like, it's like your spine. Up there, it breaks to the left. Over here, it breaks to the right. And breaks come from water, like this screen here is very high here. -Water, you gotta get water off these greens. So balls go where water goes. STEVE ELKINGTON: We're gonna to fill this hole up with water. And when it overflows, it's gonna overflow first on the lowest side. JACKIE BURKE, JR.: This is the this is the lowest point of this hole right here. OK? So this is the experiment. STEVE ELKINGTON: This is the first place it leaked on, right? JACKIE BURKE, JR.: Right. So that-- there it is right there. Now we're watching the whole show. OK.
STEVE ELKINGTON: There's your fall one. Just by law of mathematics. This putt here has to be straight. It came straight up, straight up the fall line. -On a green there's a spine to it. And if you go this way, it's slow. And if you come this way, it's fast. And if your ball is up here, It's gonna break that way. And over here it's gonna break that way. I mean, you-- that's every green in the world. -I-I aim with this slope over here. I just aim it out on a break line and let the ball have a chance to break. -Because in your-- in your-- in your deal? -Yeah it's perfect. And if I-- and sometimes they go in. -You know, but a putt this long, you know, it's pretty, pretty lucky if you g-- if, you get one of 'em in. Mean, that had a chance to go in. -Just a little, little shy. -He always says, you've gotta know you're going to be a great putter. He says, it's only going to be two things, we're either gonna putt great or we're going to putt miraculous today. That's how he went about it. So let's talk about how you would approach this putt. -I'm just bringing that circle up here. And I've got it right here, the same as those two clubs down there. -That's what you're feeling right here. That's what I feel there. I'm just trying to make a circle up here and put one down there. You just walk in, just like this was a chip shot. STEVE ELKINGTON: That's pretty good. Is it going to get in the circle? Oh here it comes. Oh, there-- [LAUGHS] Are you kidding me? You, you almost made a 120 foot putt. How did you do that? How did you, how did you know how hard to hit it? -You putt that long, you really come down here halfway and see how hard you would roll it from here. -And then go by and times two that. -So you would come halfway sometimes? -A lot of people think that if you took up a putter up here and just had a simple concussion, they think that's as good as you can hit that ball. But I'm here to tell you that a putt can be hit way better. -It's just the same as pool. -You topspin a cue ball. -Top spin or you under spin, or side spin. -Yeah. And then you, you hit a-- shootin' pool, you hit it over here and you hit it over here. -So a ball, uh, a putt-- when you see a person like Mr. Burke putt, you quickly understand that a putter can be hit-- a ball with a putter can be hit so much better than just a simple concussion of-of two objects colliding. He makes it hug the ground. He makes it, he makes it roll into the hole like it has no other place it-it's going. -The early days when you were a caddy, you had that one club. I had a seven-iron. And I would putt with my seven-iron. And I'd just topspin the ball. -He likes to hit the ball slow enough to where it uses the whole hole. Whenever you play golf with Mr. Burke, he wants it coming up topspin, at the right speed, so it will fall in the side doors, like a waterfall. Waterfall, everything goes over the waterfall. It will fall in. He doesn't believe in banging it in the back of the cup. -That, that that's that's one. One is like, what? 3 inches. -Right, and it's only going to turn over maybe six times. -Six times on a on the three foot surface. -So why are you hitting it so hard? You can thump it-- you can almost thump it with your fingers. -See, you don't need to to have a lot of force behind the ball. -Y-You get a ball and you just touch it. -The old saying, you gotta putt and hit the back of the hole. Don't ever think of that. Never hit a ball that hard. STEVE ELKINGTON: And there, there's some mathematics behind this which makes sense to every person. This ball weighs a certain amount of-- this ball weighs a certain amount. If this hits it so fast, then gravity can't take any impac-- it can't act on it as it goes across. If I hit that fast, there's no gravity. Mr. Burke believes that if the ball's coming along at a slow speed, then gravity can easily take part of that. 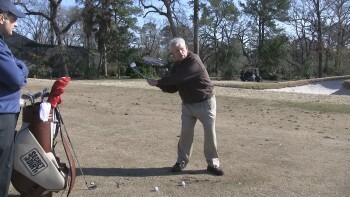 -You have to time the ball just like you do a golf swing. You have to time and picture the rolling of a ball. And don't hit it so hard that you roll through the break. -I can almost putt this putt straight from here. Like that. -Now. Or, if I was putting, same putt I could let it-- that's a better one. You like that one 10 times better. -Yeah. If you had hit that hard, that-- you'd've missed that putt. -Well, it's not their job. It's not their business. -Like it is our business. -Maybe the way to explain is when we come on, we know that the grain is there. That's going to add to this, that's going to add more slice to this one. -It's slow because the sun's comin' across here. When these blades of grass wake up in the morning, they they're, they want to point to where the sun is. So this is east. That's west. And what that blade of grass does, it comes up in the morning and it follows the sun all day until it drops down on the west side. Now if I took my putter and I drag it, you can see all the bristles stick up. All that grass is laying west. If you walk up to the hole here, you'll see on this side of the cup it's very smooth. All those grasses are laying over that hole, makes a very smooth edge. On this side of the cup, we call this a blowout. The little pieces of grass want to fall out. You see that? It's because they can't attach themselves right there, because everything's going west. -Ball's going to break to that spot right there. Now the interesting thing about this putter that you love so much is, lot of people won't know this, but-- this putter was back in the day, this was, this was 4.5 inches, exactly the width of the hole. -The height of the ball. -And I don't trust it. So I've worked hard on rolling a ball. -Well, I don't trust any putter. I just put it down every time. And it's just an instrument for me to roll something. JACKIE BURKE, JR.: You can take a dinner knife and roll that ball. I don't rely on that my putter will do it. My stroke is going to do it. -Your stroke is going to do it. -Yeah. Because I can take a-- you can take a stick, the other end of it, and roll a ball and topspin a ball with the other end of the putter. -I-I-I'd send you to a psychiatrist. STEVE ELKINGTON: Yeah Well, I just wanted you to know, this is the answer. You don't even like holdin' it, do you? -Well there's so many lines down there. And, and, uh. STEVE ELKINGTON: That was built to help you. -And you're saying it's not. -It is built to, uh, get this guy a lot of money for this thing. Th-th-this should be a w-- I could've used this in the Marine Corps as a weapon. This isn't a putter. STEVE ELKINGTON: It's not a putter? -If you turn it around, you can kill somebody pretty easy with this. -But these guys would put that here and it-- and, look it's even got instructions that tells you how to-- it says, choke down on the putter for optimum performance. -Well, they need it-- the only thing they're not selling now is the putting pill. We need a pill for putting. Putt-putt pill. Now, there's been a lot of talk about guys who put it in their belly. But you've been telling me, show me your stance back in the-- you said that you guys belly putted your whole life. Well the basic stroke was just you did that. That's all it was. -Everybody when we watch those films, everyone says to you and me, oh you guys don't know how to putt back then. You guys are all real wristy. Like Arnold Palmer. -How do you, how do you time that and all that? -Well because you have to do that in every shot. Every putt, every chip shot. You c--you can't stiff arm something. There's no fe-- if you put tension in, in a stroke, there is no stroke. A stroke, a stroke is something that you do that with. I don't care if you're a chipping or getting ready to hit a driver. This arm is going to go over this arm. Every time. -And if you're just trying to hold the putter straight, you've got to be kidding. -Well, a lot of people just try to do a little straight straight, right? -Yeah they, they-they try to get up here and putt this way. But if your shoulders are tense, you're tense everywhere. You need to let your arms hang just hang 'em. And pick a putter and put it right up there in front and over the top and just let the blades swing at the ball. You just in and slow, and you're low. -I-I'm in and slow, and low right now. -Y-you haven't missed one today. -Ah, I see I'm sorry. I-- I forgot that bit. I Forgot that bit. So people that don't know what you say-- mean by low and slow and inside. Tell--show us what you mean. This putt's going to be a little left to right. JACKIE BURKE, JR.: This is the line. And he gonna take it inside the line. -And you want slow and low on the inside of that. -I take it back along the ground and I stay inside. -That would've went into a mouse's ear, that ball right there. -OK. You're low and slow. -Well I asked him, why do I go outside? -If you knew this, you wouldn't be going outside. -There you go. So we don't go back. We don't do a lot of in retrospecting. He just, whenever I've been told by Jackie, we never-- he doesn't ever take me back to what I shouldn't-- he only tells me what I should be doing. We don't say, he's never taught one. It's just this is what we're doing. Jackie Burke told us what the stroke is. In and low and up. Make it topspin. So it's like everything. You know, it sounds simple. It is simple. But it's a stepping-- it's a building block. It's a cornerstone. So that's it? We don't need any more? -I don't thank you need anymore. -Is that all a person needs? I think it is. -Ah, see he's lucky. He's lucky. Get that ball out of the hole. NARRATOR: We catch up with longtime friends Elk and Rocco. -One of the things you and I have enjoyed about being together the most, we like to talk about our swings. NARRATOR: --To see how golf is played when the pressure is off. STEVE ELKINGTON: We have fun when we play golf together, Rocco and I do. Everyone loves Rocco. He's a-- he's that guy that's fun to be around. -What do you think on that one? NARRATOR: And get a taste of what's cooking on the big show. -Not bad after a long day of golfing work, huh? Dinner was one of the most memorable experiences I've ever had in my life. I-I felt like I was in Sicily.